John attended the State University of New York at Cortland where he received a degree in health and physical education in 1968 and The University of Pennsylvania where he received a Certificate of Proficiency in Physical Therapy in 1970. John was an instructor and Athletic Trainer at West Chester University in Pennsylvania and later helped co-found the Berkshire Sports Medicine Institute in Williamstown, MA. John has also been active in skier fitness and developed the Ski Fit Profile that measured the fitness of skiers which was used at Stratton Mountain, Vermont and a number of Ski racing academies in New England. John founded Repsher and Associates Physical Therapy in 1980 in Albany, NY. Mr. Repsher has treated thousands of patients in the Capital District including professional, collegiate and Olympic athletes. He is a published author, having submitted two chapters to the first edition of the A.M.A. award winning book Athletic Training, and has conducted numerous seminars for doctors and physical therapists across the country and in Spain. One of John’s areas of interest is rehabilitation of shoulder injuries including rotator cuff tears, tendinitis, total shoulder replacements and reverse total shoulder replacements. John is a member of the American College of Sports Medicine, a member of the American Physical Therapy Association and a certified member of the National Athletic Trainers Association. Matthew attended Quinnipiac University where he received his degree in Physical Therapy in 1995. His areas of expertise include the treatment of orthopedic and sports related injuries including total joint replacements, rotator cuff repairs and ACL reconstructions. Matthew has completed the McKenzie Spinal Series which addressed the pathology and treatment of spinal dysfunctional. He is trained in the Quadrastep System, which evaluates a patient's foot type and determines a specific pre-fabricated orthotic for different foot type conditions. Matthew lectures on a variety of topics including Overuse Injuries in Runner & Golfers as well as Low Back Pain at the Ciccotti Center. He is also on the Medical Advisory Board at the Ciccotti Center where a team of local health professionals advise the center on different health and wellness issues. Corey received his Masters of Physical Therapy Degree from Quinnipiac University in Hamden, Connecticut in 2005. He is a Certified Strength and Conditioning Specialist through the National Strength and Conditioning Association and a certified coach through the Road Runners Club of America. 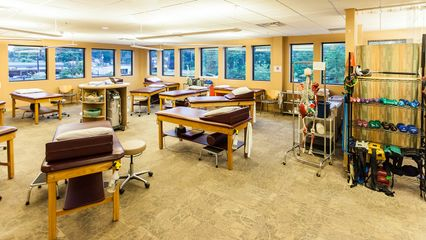 He also has met the Credentialing Level status established by the Mckenzie Institute International and is recognized as a Certified MDT (Mechanical Diagnosis and Therapy) clinician. His areas of interest and expertise include general orthopedic conditions, sports injuries and post-op rehabilitation. He holds specific interest in the treatment of hip pain and joint preservation. Joyce received her clinical doctorate in Physical Therapy from Russell Sage College in 2008. She received a degree in Biology from St. Lawrence University before receiving her BS in Physical Therapy from SUNY Health Science Center in Syracuse, NY. She is currently a certified McKenzie practitioner with many years of experience in rehabilitation of spinal injuries and pain. Joyce worked as an athletic trainer at Cornell University and enjoys working with orthopedic and athletic injuries. She is currently a ski instructor for the Adaptive Sports Foundation for the mentally or physically challenged in Windham, NY. Joyce lives in Delmar with her husband and four children. Steven graduated from Utica College of Syracuse University in 2006 with his Masters of Science in Physical Therapy. He has been working in orthopedics since that time in both outpatient and acute rehabilitation settings. Steve completed his Doctorate in Physical Therapy through Utica College in 2010. Steve has attended continuing education with Kevin Wilk, D.P.T., a leader in the field of Physical Therapy for shoulder rehabilitation. He enjoys the challenges of helping people work through a variety of orthopedic conditions. He also believes in providing patients with the toolset provide healing, as well as prevent injuries and enhance life long wellness. Steve enjoys cross country skiing, golfing, and spending time with his family. He lives with his wife and son in Clifton Park. Shane attended Stony Brook University where he received his Doctorate in Physical Therapy degree in 2013. Shane's areas of interest include orthopedic and sport injuries, and he enjoys helping people recovering from knee and shoulder surgery return to their prior level of function. He has furthered his knowledge and clinical skills by taking continuing education courses, such as therapeutic taping for musculoskeletal injuries and the Part A series of the McKenzie MDT approach, which focused on the assessment and treatment of the lumbar spine. Shane enjoys playing golf and going to the gym, and he encourages his patients to be physically active outside of the clinic as well. It is his goal to help clients leave feeling confident to do beneficial exercises at home. Originally from Broadalbin, NY, Shane currently lives in Schenectady with his wife. Mikaela attended Springfield College where she graduated in 2011 with her clinical doctorate in Physical Therapy. Mikaela worked at Albany Medical Center from 2011-2014 working in the inpatient hospital setting as well as the acute rehabilitation facility. Mikaela is a very active individual who has been training in the martial arts for 19 years and has been an instructor for 10 years. She loves to work with other martial artists and athletes to help them achieve their goals. Mikaela lives in Albany, NY with her husband. Susan graduated with her clinical doctorate in Physical Therapy in 2015 from The Sage Colleges Graduate School in Troy, New York. Prior to this, Susan attended Bay State College in Boston Massachusetts where she graduated from the Physical Therapy Assistant program in 2001. For the past 14 years, she has been practicing as a licensed physical therapist assistant both in inpatient and outpatient settings; most recently with St. Peter's Health Partners here in the Capital Region. Susan's vision for the future is to work towards an orthopedic specialty along with specializing in the treatment of patients with cancer. She enjoys educating patients with a preventative and wellness approach to physical therapy. She lives with her husband and their two daughters in the Capital Region. Nate received his Doctorate in Physical Therapy in 2012 from Sage Graduate School and his Bachelor's in Biology in 2006 from S.U.N.Y. Cortland. He is a certified clinician through the The McKenzie Institute® USA for Mechanical Diagnosis and Therapy® (MDT) for the back, neck and extremities. His special interests are neck and back related injuries with radiating symptoms into the upper and lower extremities. Nate has also taken continuing education in the treatment of dizziness and balance disorders. Outside of work, he enjoys spending time with his wife (Kaylee), son (Owen), and daughter (London) as well as playing soccer, golf, and weight lifting. Nate is originally from Endicott, NY and currently lives in North Greenbush. Stephanie attended Boston University where she received her Bachelor's in Athletic Training in 2013 and her Doctorate in Physical Therapy in 2015. She enjoys all orthopedic injuries with a special interest in sports rehabilitation and post-operative rehabilitation. During her schooling, she had the opportunity to intern at orthopedic clinics in both Colorado and North Carolina. As an Athletic Trainer student she got to work with sports teams including the Harvard men's basketball team and the MIT football team, working to prevent injuries, triage injuries during competition and rehabilitating student athletes back to sport participation. Outside of work, Stephanie enjoys hiking, playing and watching sports and traveling. She Currently lives in Clifton Park. Peter received his Doctorate of Physical Therapy from The Sage Colleges and holds a Bachelor of Arts from the State University of New York (SUNY) in Albany. He is Board Certified in Orthopedics (OCS) from the American Board of Physical Therapy Specialties, and a professional member of the American Physical Therapy Association (APTA) and the APTA Orthopedic Section. An avid runner, Peter has also completed several marathons.